The Village of Franklin Park is located in the center of it all. Adjacent to O’Hare International Airport and a short drive or train ride to downtown Chicago, our vibrant community is a great place to raise a family or operate your business. 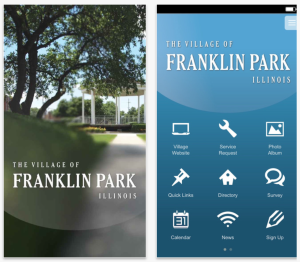 The Village of Franklin Park’s Smartphone Application is a free interactive tool that serves as a resource for both residents and community members. It’s a great way to keep up to date on news, information and events happening in our community. The app features department information, staff directories and a calendar and news feed. It also allows you to report a concern or ask a question. Download the Village of Franklin Park’s smartphone app today! Click here to download the Village of Franklin Park Smartphone Application on iTunes. Click here to download the Village of Franklin Park Smartphone Application on Google Play.